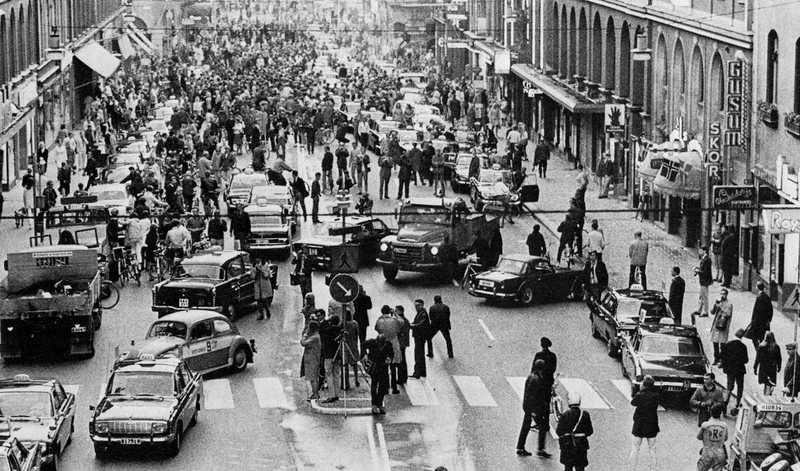 Meaning literally, “right traffic day,” Dagen Högertrafik, or “Dagen H” (H day), was the day in 1967 that the country of Sweden managed to successfully switch from driving on the left-hand side of the road to the right. Not a spur of the moment decision, the Högertrafikomläggningen (“The right hand traffic diversion”) had been planned for years prior to implementation, in recognition of the inherent problems that arose by the fact that among the nations of Continental Europe, Sweden was the only country where people still drove on the left. (If you’re curious why, see: Why Some Countries Drive on the Right and Some Countries Drive on the Left.) In addition, the architects of the plan tapped into the widespread perception that having the steering wheel on the left while also driving there caused more head-on collisions. Regardless, switching to the right was not a popular idea among Swedes, and when the idea was first floated in 1955, only 17% of the populace approved the change. However, realizing that in the late 1960s nearly 10,000,000 cars would cross Swedish borders one way or another, and knowing that that number was predicted to double by the early 1970s, Swedish leaders decided to make the switch. Voting for the Statens Högertrafikkommission (HTK) in 1963, the Swedish Riksdag instituted a commission that established a four-year program to make the change and educate the populace. The switch necessitated the replacement or retrofitting of nearly every traffic light, bus (the doors were switched to the right-hand side), bus stop (which had to be moved across the street), road line and headlamp. At the time a trend had begun to arise to have headlamps direct their light to be slightly brighter on one side to illuminate the bordering ditch or sidewalk side of the road better. The rising popularity of this increased the pressure to make the switch sooner than later as those who had these headlamps made for left-hand driving, but driving on right hand roads, would reportedly blind oncoming drivers (with the extra light now shining directly into oncoming traffic instead of the side of the road) and vice-versa as cars crossed the borders. The final cost of Dagen H has been estimated at around £40 million in 1967 money or about £648 million today. In addition, prior to H day 12,000,000 notes were distributed to citizens, and 130,000 tilted H signs were deployed along Sweden’s roads, to remind drivers of the switch. On Sunday, September 3, 1967, for most of the country, all non-essential traffic was banned from 1 to 6 a.m. In these places, at 4:50 a.m., all vehicles that were allowed to drive had to completely stop, and then carefully change to the right-hand side of the road. At precisely 5:00 a.m., traffic was allowed to resume, at which time Swedish drivers experienced what Time magazine called “a brief but monumental traffic jam,” that happily resolved relatively quickly. In some of its largest towns, including Stockholm and Malmö, the ban on non-essential traffic began as early as 10 p.m. the night before, and lasted until 4 p.m. that Sunday, in order to give workers time to re-do the intersections. In total, about 8,000 officials and 150,0000 volunteers were deployed that weekend, either to convert traffic signals and lines, keep the peace, or to assist pedestrians at dangerous intersections. The following Monday’s rush hour traffic went relatively smoothly all things considered, and the 125 reported traffic accidents were fewer than the typical daily number of 130-198. Many believe that the combination of the perceived risk with a lack of familiarity made motorists more careful than they’d normally be. (For similar reasons, pedestrians are actually about 28% less likely to be hurt while crossing a street if they illegally jaywalk, rather than cross at a crosswalk that doesn’t include any additional signals like traffic lights.) Within a few years, however, accident rates had returned to normal. When Does a Speed Limit Come Into Effect? The British, who also drove on the left (and still do), observed the switch intently, although they remained unconvinced that a similar change would be in their best interests. According to some estimates, moving to the right side in Britain at the time would have cost nearly seven times what it cost Sweden, and, whether accurately or not, experts anticipated even more switch-induced accidents would occur. In addition, they noted that many countries, including Ireland, Malta and Cyprus, had their own traffic eccentricities that worked just fine, even with tourists. For instance, the people of Timor drive on the right in East Timor and the left in West Timor… Ambidextrous drivers. In aircraft, the “rule of the road” is keep-right when passing oncoming air traffic. Interestingly, in dual-control airplanes, the captain always sits on the left side of the plane as you might expect, but in helicopters, the captain sits on the right hand side. Many early cars had the driver’s seat in the center of the car rather than on one side or the other. Gradually, car manufactures began putting the seat on one side or the other. Some chose to put it on the side closest to the curb so that people could more easily avoid scraping buildings, curbs, etc. Other car manufactures would put it on the opposing traffic side to help reduce car to car collisions, which would tend to be more deadly. Many early American motorized vehicles actually placed the steering wheel on the right hand side of the car, even though America used the keep-right rule. This practice finally was put to an end largely due to Henry Ford; he preferred the left side steering wheel so Ford cars featured this. Due to their popularity, this effectively squashed the right hand steering wheel cars in America. According to research done in 1969 by J.J. Leeming, keep-left countries have a much lower collision rate than keep-right countries. It is thought the reason behind this is that most people’s right eye is their dominant eye. Thus, the right eye in keep-left traffic is the one closest to oncoming traffic and so should reduce collisions. Another theory as to why this might be is that most people are right handed, so when driving a manual transmission car in a keep-left country, most people’s dominant hand is on the steering wheel; this could help in a person’s ability to maneuver accurately. Most horse riders and cyclists will naturally mount the horse or bike from the left hand side. In the cyclist’s case, this is why most bike chains and gears are on the right side of the bike so that the rider can walk along on the left side of the bike and not worry about getting pants or shoe laces caught in the gearing while walking beside the bike.